Named after the zombie-like stilt character that prowls around during Carnival celebrations, this sauce features two ingredients common to Trinidadian commercial sauces, papaya and mustard. The sauce can be used as a condiment or as a marinade for meat, poultry, and fish. 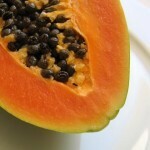 Boil the papaya in the water in a large pot for 10 minutes, then remove and cool. Peel the papaya, remove the seeds, and chop it into 1-inch cubes. Combine the papaya with the remaining ingredients in a sauce pan. Bring to a boil, reduce heat, and simmer for 20 minutes. Remove from the heat, cool the mixture, puree it in a food processor, and bottle it. The sauce will last for weeks in the refrigerator.